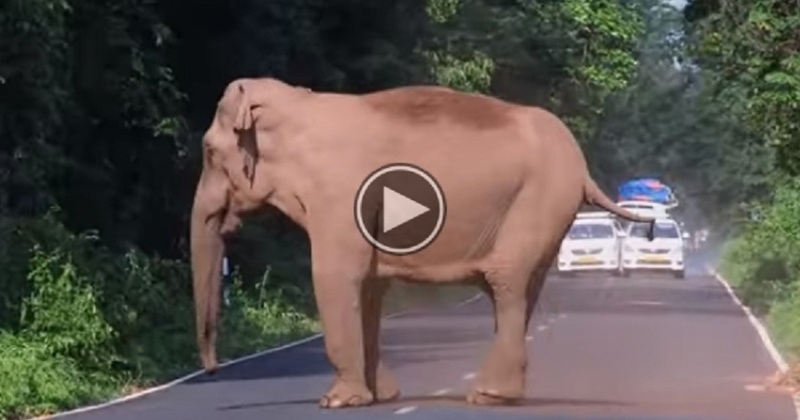 Mama Elephant Blocks The Road For THIS Reason. Aww, I Can’t Stop Smiling! This amazing video captures just how smart elephants are! The leader of the small group of elephants emerges out of the jungle and on to the road. There is a cyclist right in front of him so he chases the man away. The elephant continues to stand in the road causing a traffic jam. The motorists coming towards him stop immediately not wanting to have him direct his attention towards them and potentially damage their vehicles or cause them injury. The elephant continues to stand across the two lanes of the road until he feels the road is safe to cross. When there is enough distance between the elephant and traffic he signals. From the jungle emerges the rest of his small pack including a very young elephant. They quickly cross the road into the other side of the jungle and it is as if nothing ever happened. This truly shows how humans and animals interact when their lives intersect.